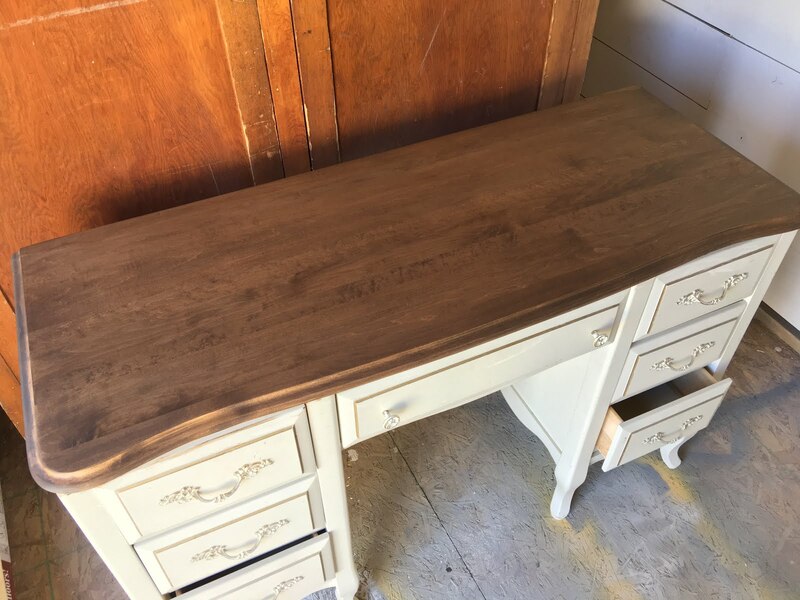 French Provincial furniture is a style I pick up whenever I can find it. 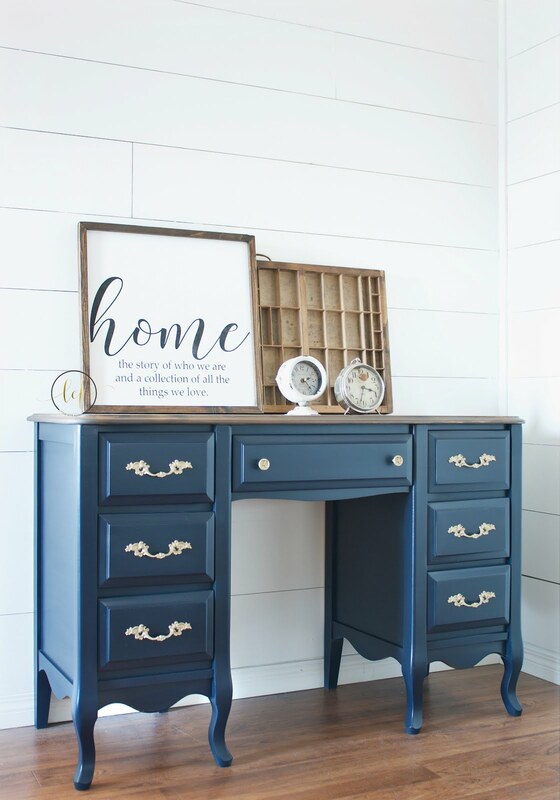 It's beautiful refinished and carries bold colours and neutrals so well. 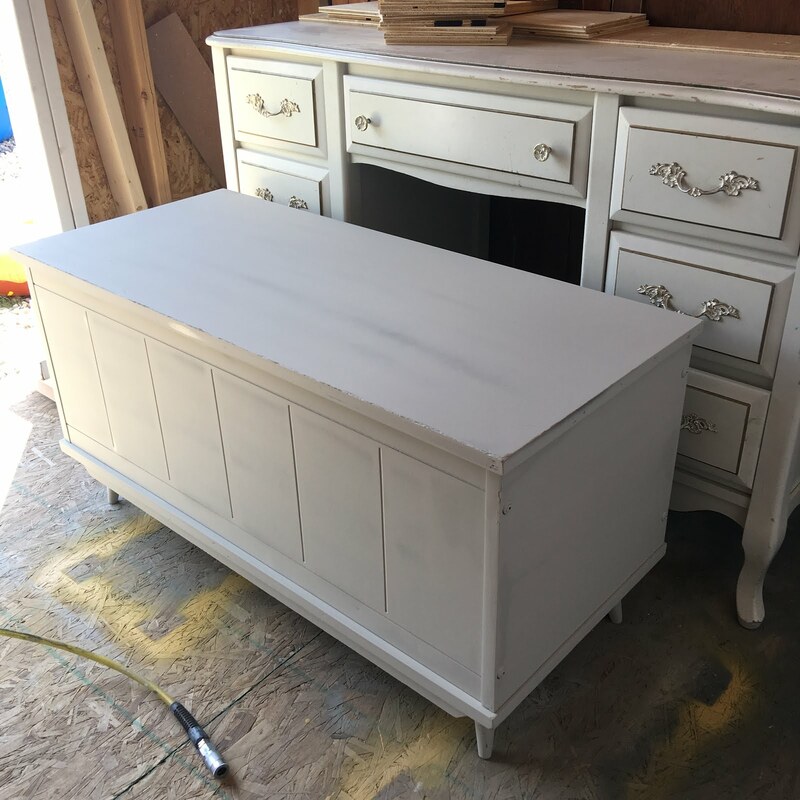 White, chipping factory finish, outdated gold pinstriping on the drawers. It needed something fresh. I sanded the flaking top until it was smooth and ready for stain. I graduated sandpaper grit from 80 - 120 - 150 to ensure a perfectly prepped surface with my orbital sander. I then hand sanded it to make sure there were no imperfections from the orbital sander on the desk top. Going any higher than 150-180 with your grit on a hard piece of wood will seal off the grain and make it difficult to get an evenly stained finish. To prep the body, I vacuumed it, cleaned it really well with Krud Kutter and warm water, sanded it with 150 grit, and then vacuumed it again. 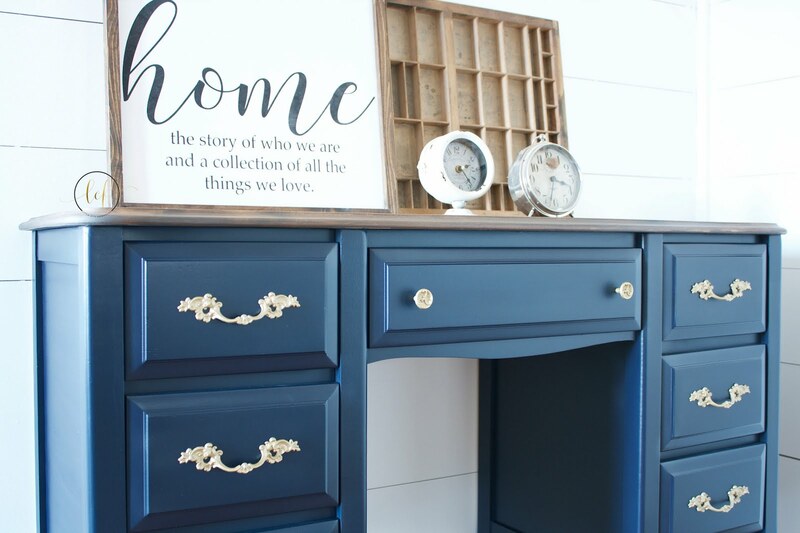 I sprayed on two coats of Peacoat from Country Chic Paint. It's no secret, but I love navy. It's such a beautiful rich neutral that goes with absolutely everything! I didn't distress this piece because what was underneath was white. I love the stately look it has in a solid finish. I gave the body of the desk three coats of satin poly to seal it and protect it. The original hardware was white and gold and just wasn't jiving with the look of the desk, so I sprayed it in a dull gold spray paint. I knew from the moment I picked up this piece that I wanted to paint it navy, and I think it turned out perfectly! I can see this piece in a girl's room, in a home office or living room, or even in a master bedroom as a vanity. Have you used Peacoat before? If not, make sure you are following Country Chic Paint on Pinterest to gather ideas on what you can use this colour on! 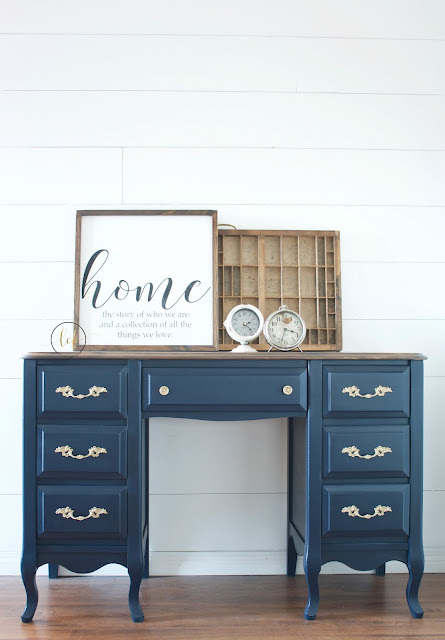 And pop me a message if you'd like a 10% off coupon code on your paint purchase from Country Chic Paint!